Hazardous (Classified) Locations (HL) are defined as areas where fire or explosion hazards exist due to the presence of flammable gases, vapors or dusts. The various cable types in conjunction with the appropriate hazardous area cable glands, joints or terminations must provide a system that significantly limits or completely eliminates the possibility of an electrical arc or spark igniting the surrounding flammable gases, vapors or dusts in potentially explosive atmospheres. 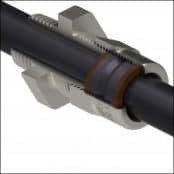 IECEx and ATEX universal hazardous area cable gland certified to II 2GD, Ex e II & Ex d IIC (ATEX). Weatherproof, waterproof (IP67), deluge proof (DTS01:1991). CSA certified Ex d IIC & Ex e II. Suitable for terminating wire braid, tape or wire armoured cables in hazardous areas, both indoor and outdoors. 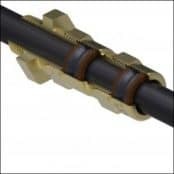 IECEx and ATEX brass cable gland suits unarmoured cables ATEX certified to hazardous area classification II 2GD, Ex e II & Ex d IIC (ATEX). The cable glands are UL listed in Class 1, Zone 0, Zone 1 and Zone 2 Hazardous Areas (Canada). 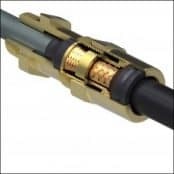 IECEx and ATEX brass cable gland suits unarmoured cables ATEX certified to hazardous area classification II 2GD, Ex e II & Ex d IIC (ATEX). UL listed Class 1, Zone 0, Zone 1, Zone 2 Hazardous Areas (Canada). Weatherproof, waterproof (IP66 IP68), deluge proof (DTS01:1991). ➡ For complete technical specification, ordering details and hazardous area certifications for these ATEX & IECEx Cable Glands please see the product sections below. ➡ T&D distribute the complete range of Prysmian Components including cable cleats, glands, joints and Prysmian Draka offshore marine cables.